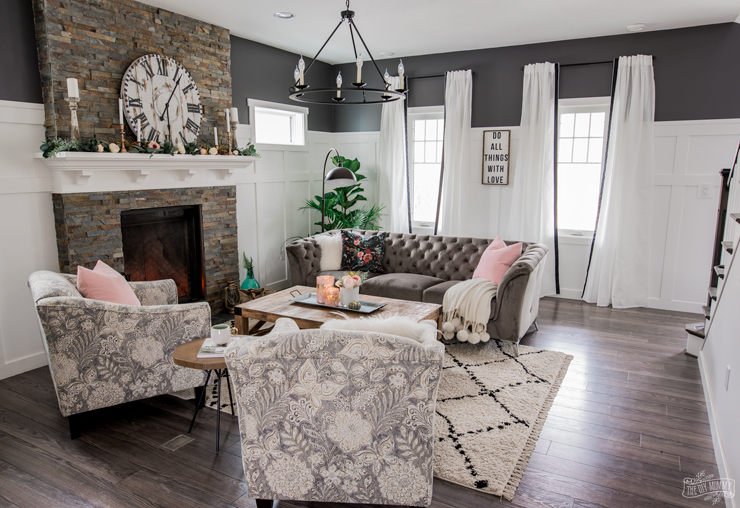 With some beautiful and cozy new furniture from The Brick, we gave our living room a rustic glam makeover for Fall in shades of deep charcoal, white, pink and gold. 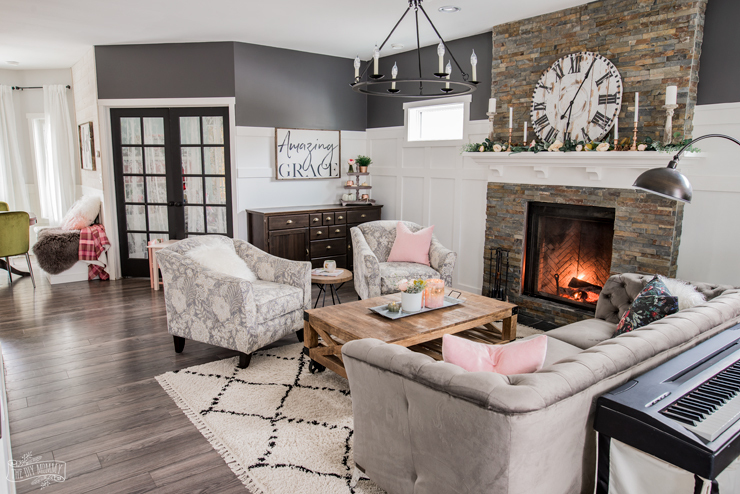 Come take a tour and get some DIY ideas to make your own living space warm and inviting for the season! 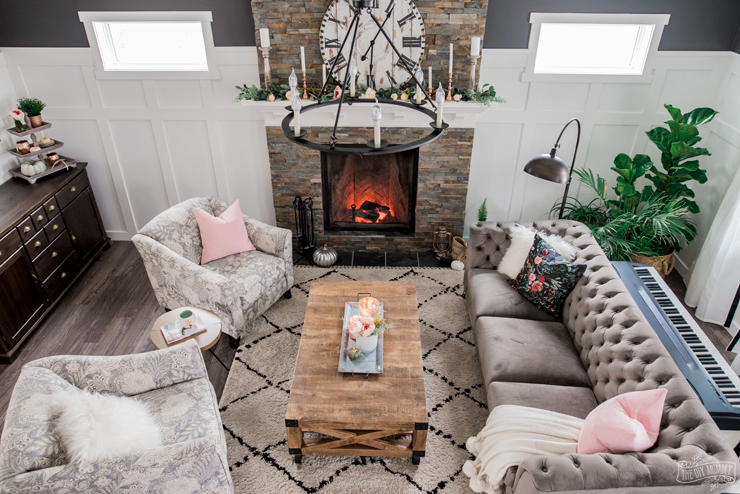 With Thanksgiving come and gone, snow already on the ground, and our winter jackets unpacked and at the ready, it’s the perfect time to make our home feel warmer and cozier for the Fall and Winter months. 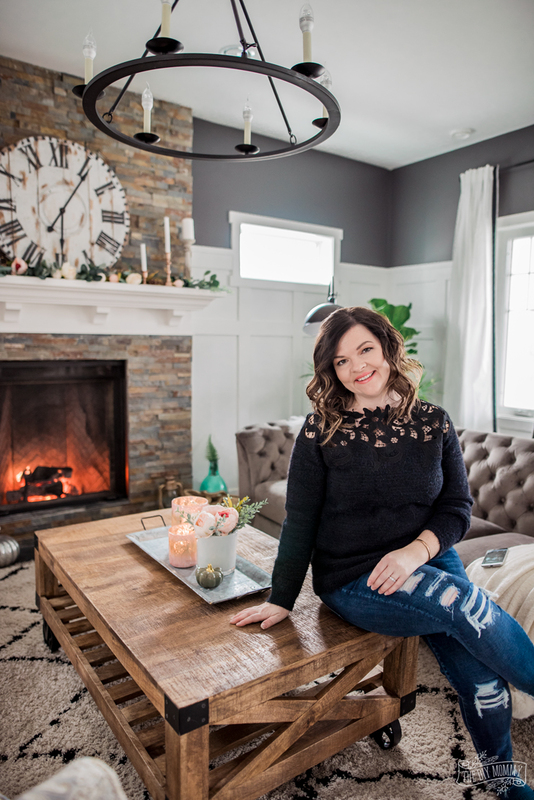 With some paint, a couple of simple DIY projects and some gorgeous furniture and accessories from The Brick, I transformed out living room into a warm retreat for our family. We decided to move our Paris sectional down to the basement so that we can start creating a “tween hangout room” for our girls this winter. 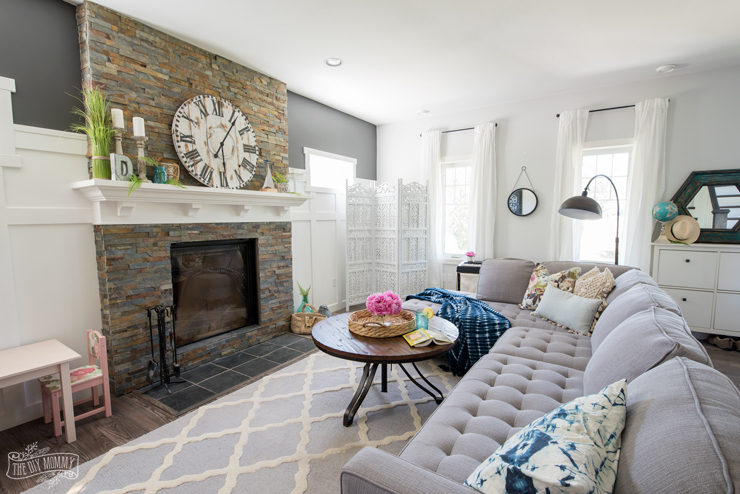 For this space, we wanted something a little more formal but still inviting. 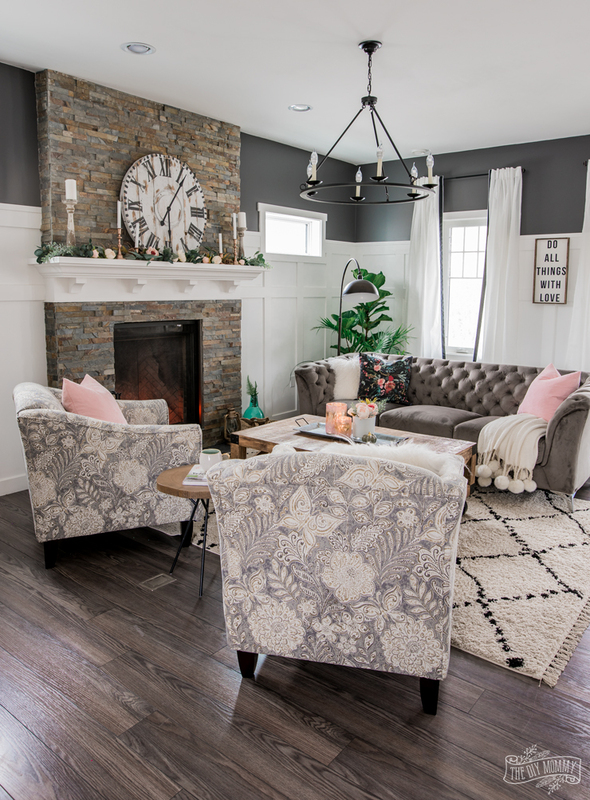 The Meredith Velvet Sofa from The Brick was the piece that set this whole makeover in motion. When I saw it, I fell in love with its gorgeous texture, tufting, and chrome legs. It has a traditional shape, but it’s still very comfortable and I’ve found the velvet very easy to clean so far. To add to the traditional feel of our living room, I took some inexpensive white curtains and sewed some black grosgrain ribbon on the edges to create some striking drapes. 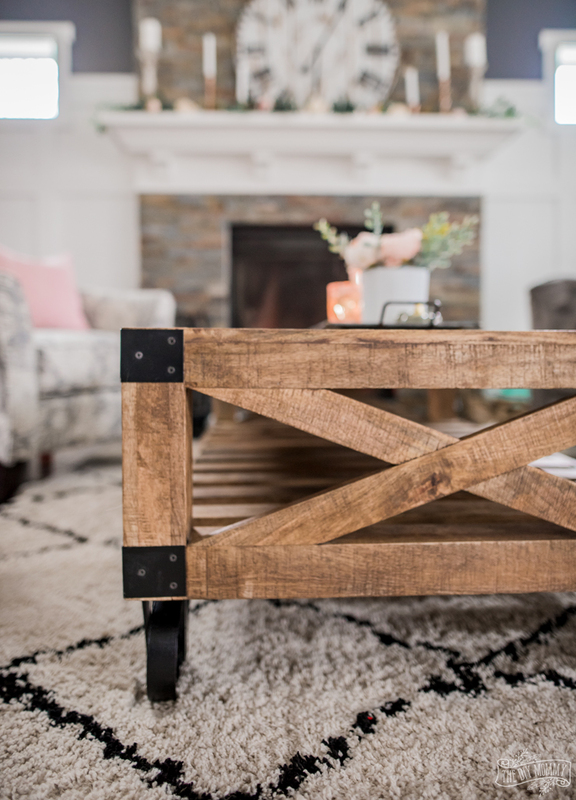 It’s an easy DIY that makes an impact! The deep charcoal colour of the sofa prompted me to continue the DIY board and batten around my entire living room and paint the whole top of my walls this lovely, rich charcoal too (it’s called Shades On by Behr). You can find my DIY board and batten tutorial right here. It’s a great way to add beautiful detail to your room and it’s not too hard to install – I did it all myself! You can see where I have to continue the trim work and paint into the entry, but that’s another project for another day! The new paint prompted a new light fixture installation (thanks, Hubby!) and I love how it really centers the room now. When we first moved into our home in 2015, I had a sofa + two chairs in this room. I really liked this layout because of all the space and versatility it created. That prompted me to look for the perfect chair pair to coordinate with our new couch. After quite some thought, I settled on this gorgeous duo – the Wynn Accent Chairs in Morning Dew from The Brick. Even though these chairs are patterned, the pattern is neutral enough to match with a more colourful patterned pillow on my sofa. 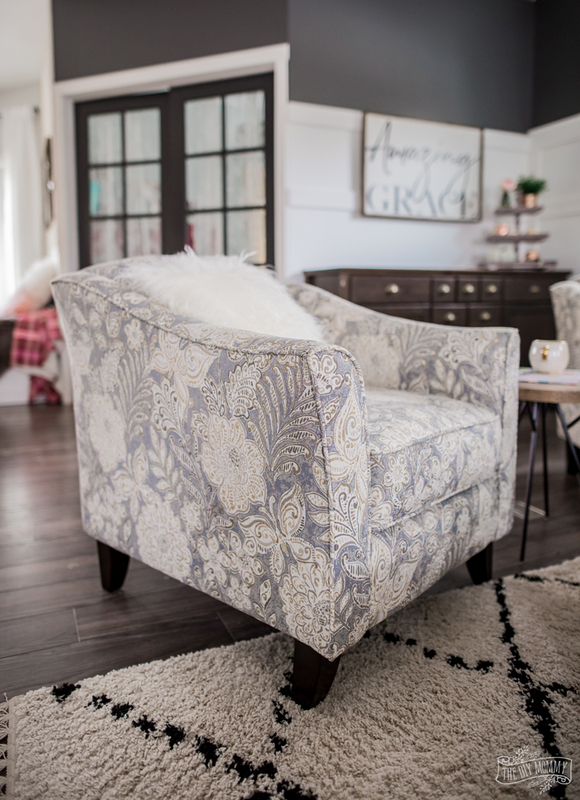 I also love how this fabric has shades of warm gold and cool grey to tie in all of my warm and cool colours in our living room. 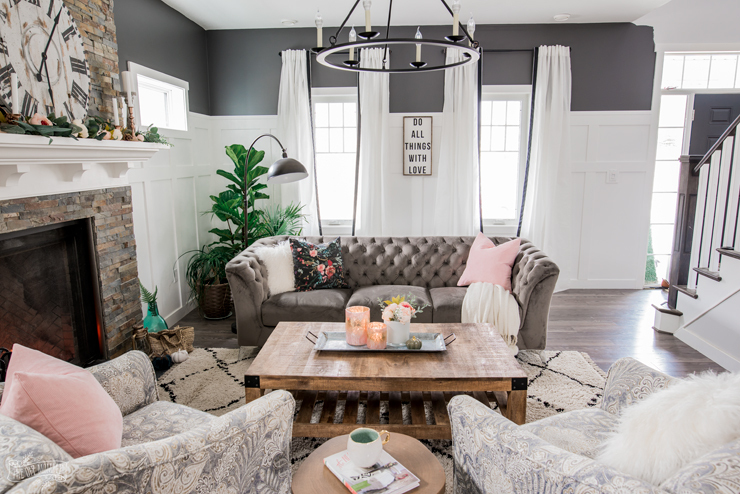 The chairs contrast enough with the sofa because they aren’t tufted and they’re a different sort of fabric, but their scale and shape mimics the sofa just enough to make them look like a coordinating set. They’re so comfy, too! 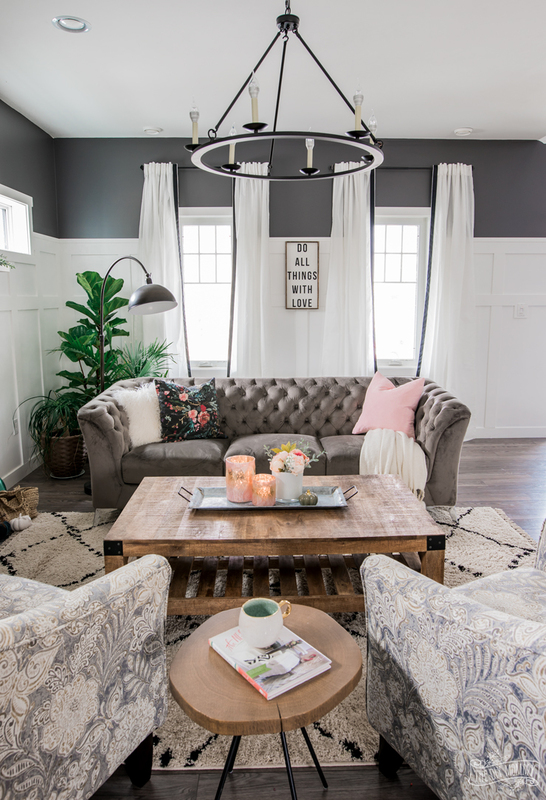 Because of all the tufting, velvet and pattern in this room, I wanted a couple of accent tables in the space that were rustic and rough to add a different sort of look and texture. I love the combo of rustic and glam! This fabulous coffee table is the Keir Coffee Table from the Scott Living Collection at The Brick. It features a rough, beautifully coloured wood with casters and black metal accents. It adds the warmth of wood to this room and ties into all the other black & charcoal elements. It’s a great size! 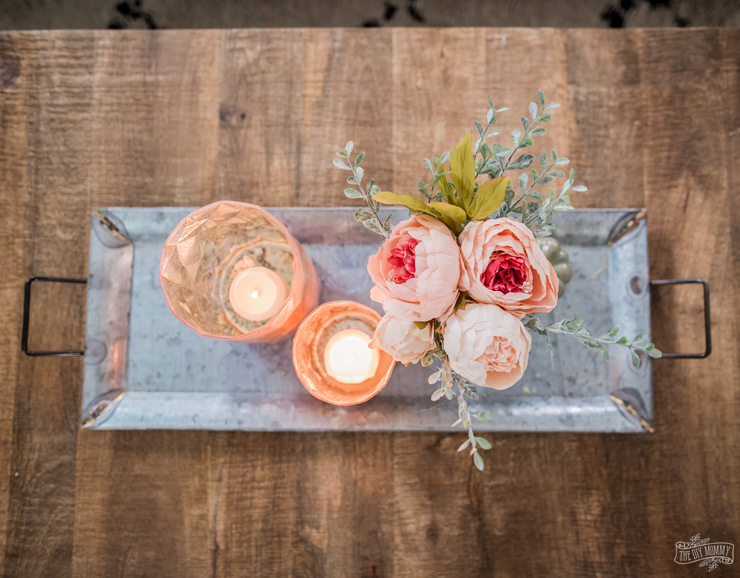 I’ve decorated the coffee table for Fall with a rustic looking galvanized tray I found in store at The Brick, and used some faux peonies and faux boxwood to create a very simple floral arrangement for Fall. 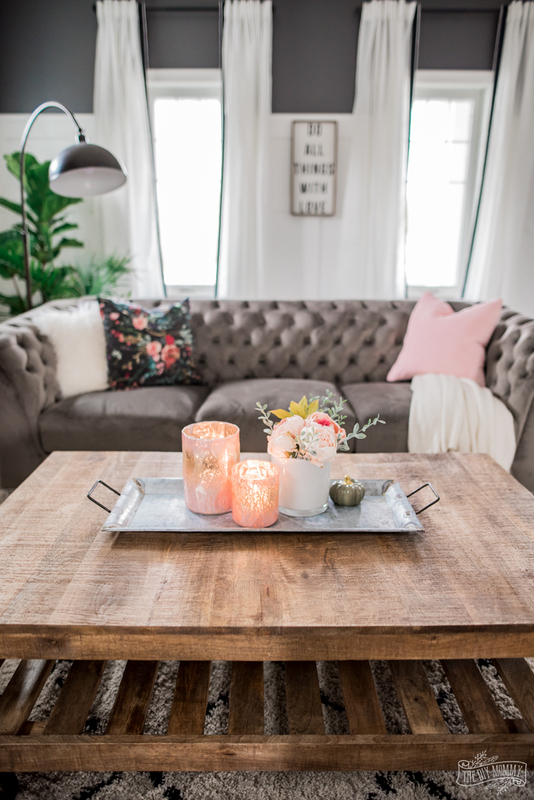 Florals and candles are always a great choice for coffee table decor! 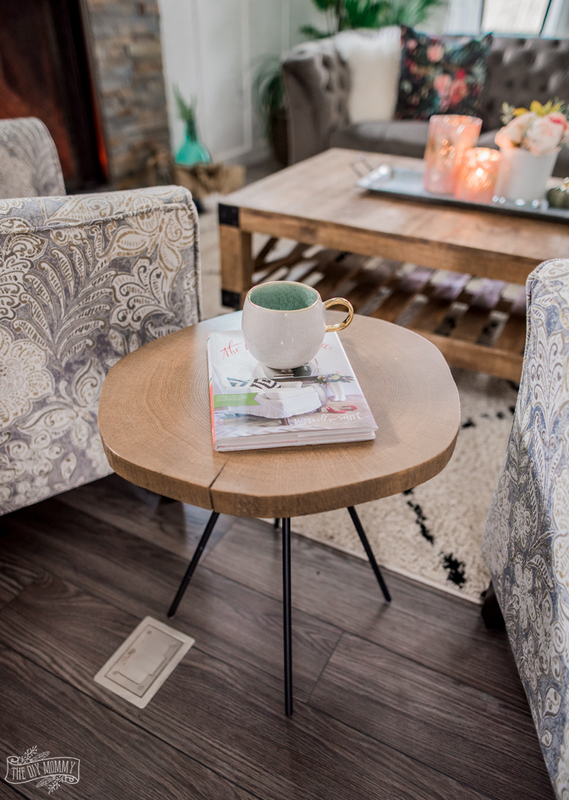 This little side table also adds warmth and function. 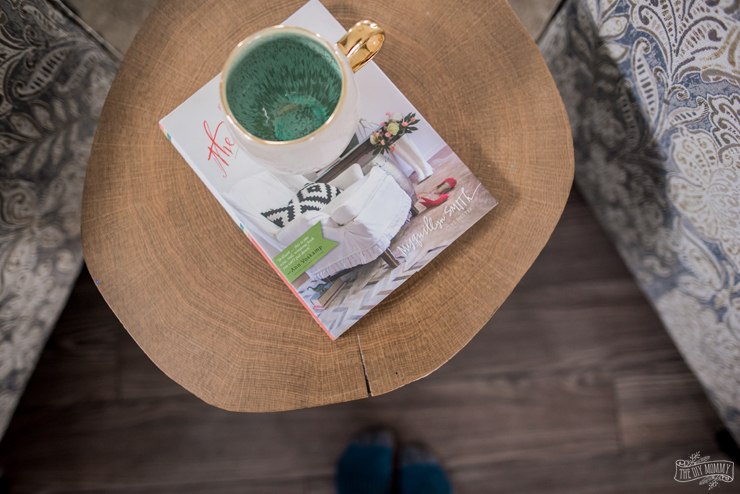 Its the Luda Accent Table in Oak (also from the Scott Living Collection), and its colour and look mimics the coffee table. It’s a lovely size for a coffee cup and a book! I really like its organic shape with all of the more crisp shapes in our living room. 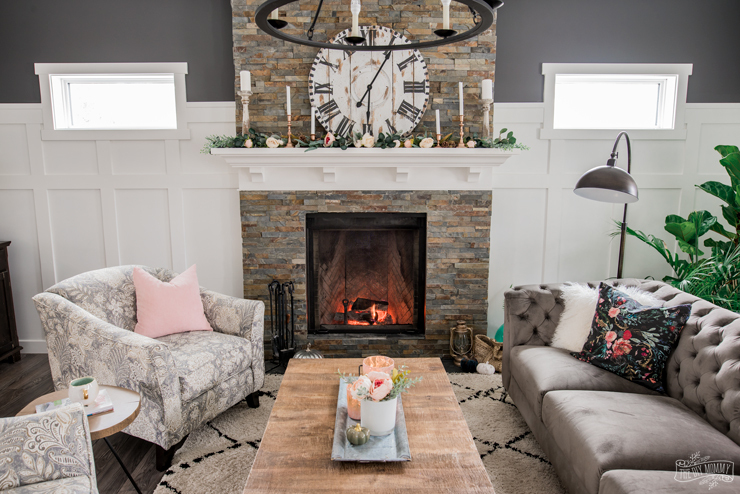 The farmhouse style wood art in our living room is from local artist William Rae Designs, and the black & white shag rug is the Ahmar Rug from The Brick. I had it in my studio, but I also love how it looks here! 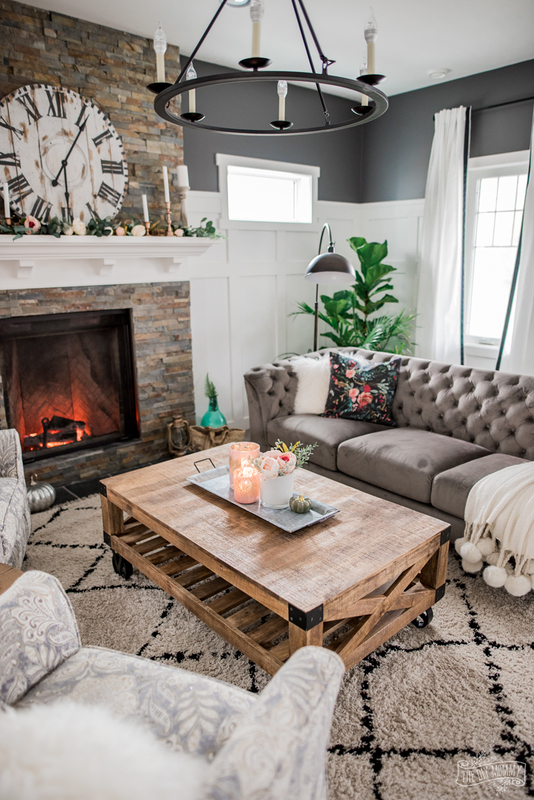 The pattern helps tie in all of the other black & white elements in the room, and the shag is so comfortable. 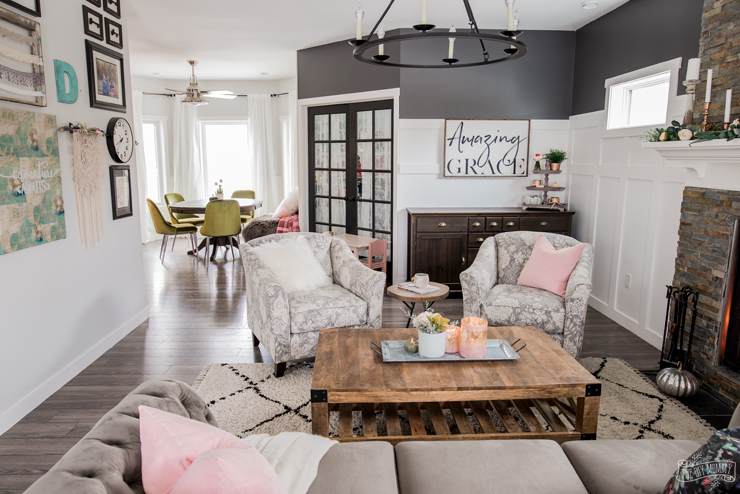 I’m so happy with how our living room makeover turned out, and our whole family loves it! It’s elegant and glamourous, but still comfortable for everyone. I’m so grateful for The Brick, my handy husband, and my arsenal of paint and DIY supplies that made this makeover possible. 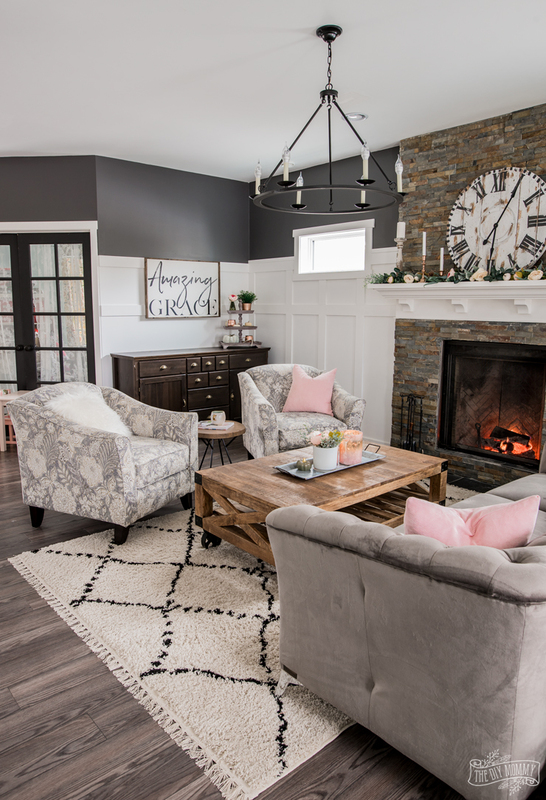 I can’t wait to relax and enjoy this cozy space this Fall & Winter! 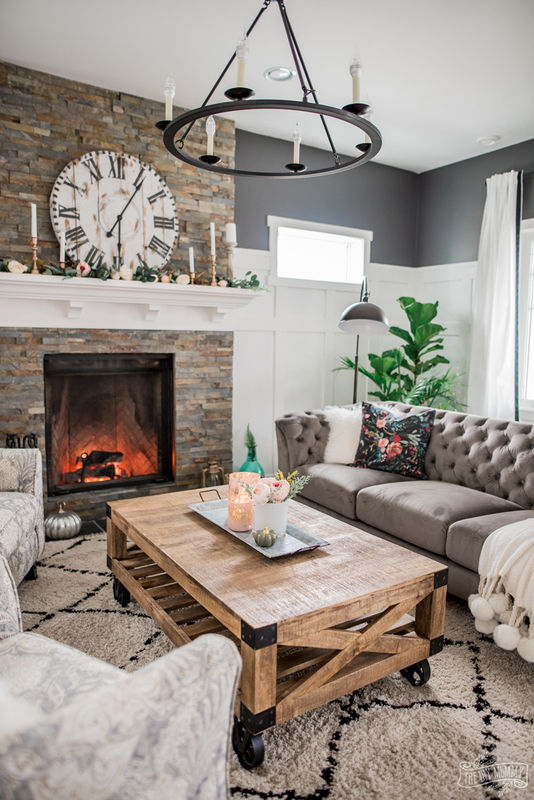 Now tell me: What elements are must-haves for a cozy Fall living room in your home? Wow! What a beautiful transformation. I had no idea the Brick carried such gorgeous pieces, I haven’t been in that store for years. That coffee table is going on my wish list for sure! This is such a beautiful transformation! I love the new wall colour and the coffee table! I’m a huge fan when it comes to wooden tables! Modern yet simple! I’m really impressed with the efforts you’re putting into your home! It’s definitely the right timing for me to start following through your site to get ideas for our new place! Thank you!